Do you love 30 minute meals? Sign me up! I love all easy recipes! Are you on the hunt for a beefy meal that will please any man’s appetite? Let me tell you, I have been making this recipe for a long time and it is a home run at our house. I wish I could take credit for this Indiana Chowder, but my it belongs to my sweet friend Kim and her family. Her and her husband’s family have been making it for years. 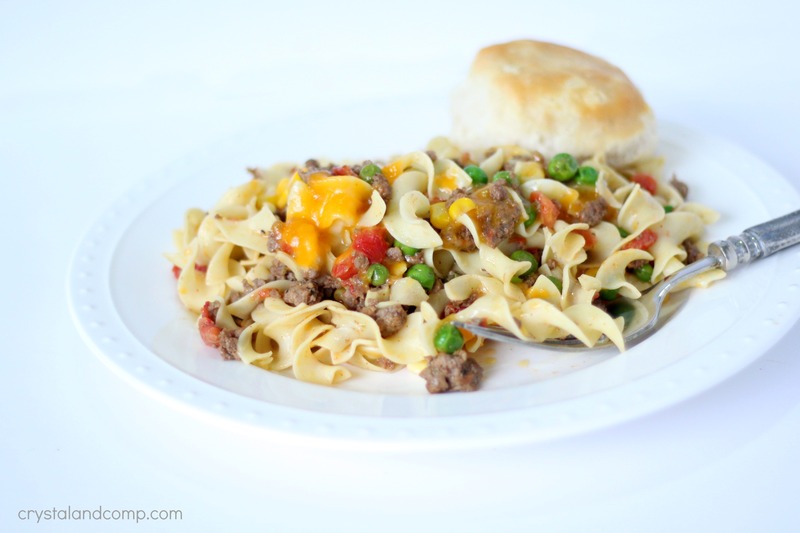 It is really easy and reminds me a lot of goulash- another ground beef and noodles recipe. In a large pot, bring water to a boil for the noodles. 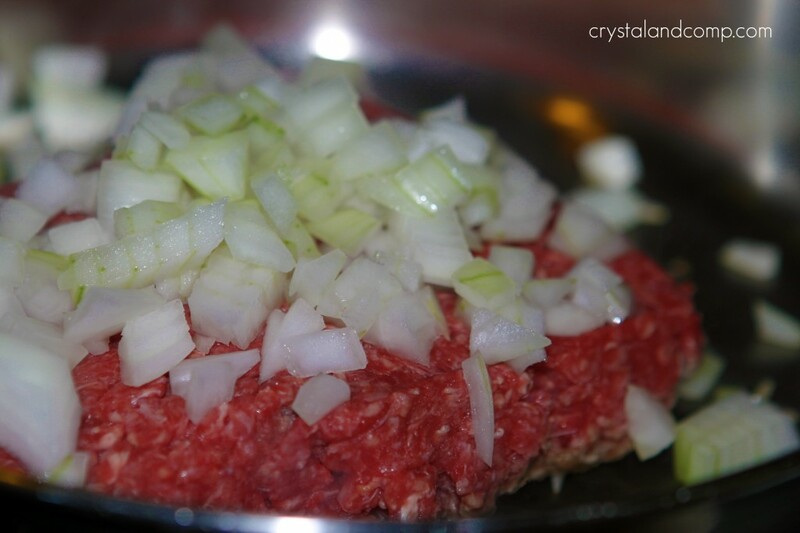 Brown your hamburger meat and onion over a medium heat in a skillet. Add the garlic and salt and pepper according to your taste. Sprinkle in the taco seasoning or chili powder. I used chili powder and just added about 1 teaspoon. Season it accord to your liking. 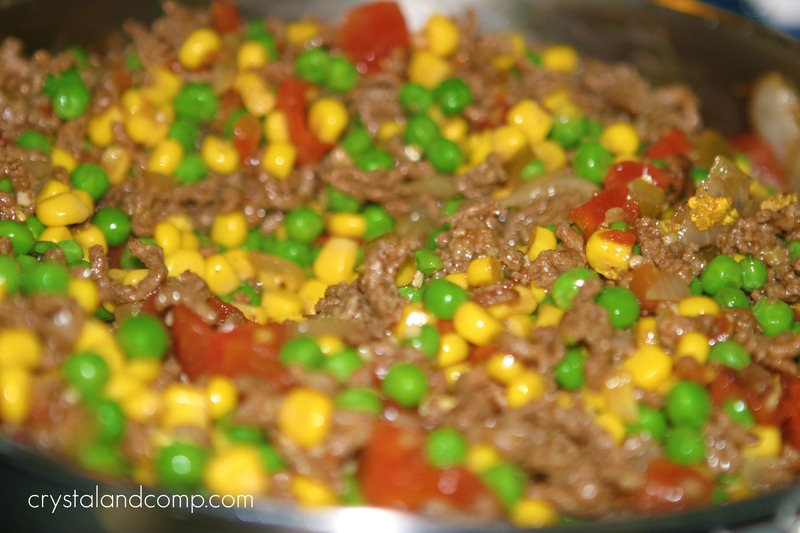 Once the beef is browned, add the corn, peas and Rotel. Combine the meat and veggies well. Continue to cook over medium heat, stirring occasionally. By this point your water should be boiling for the noodles. Add the noodles to the water and bring to a boil according to the package directions. Generally they cook in about 8 minutes or less. Once the noodles are done, drain and return back to the pot. Pour the meat mixture into the pot with the noodles. 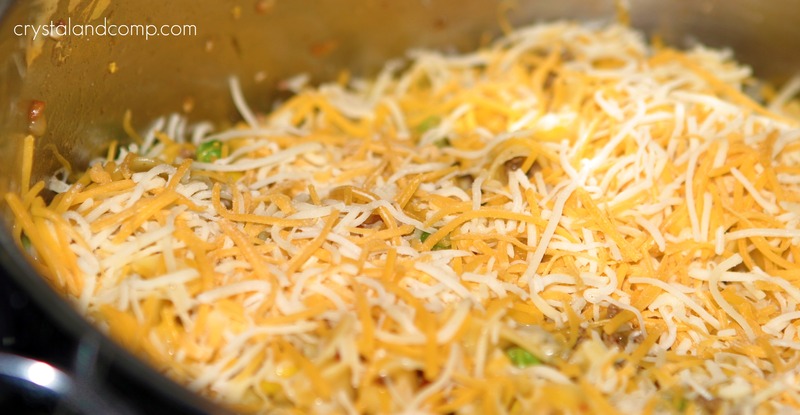 Cover the top with shredded cheese. Place a lid on it and let it set for about 3-5 minutes until the cheese melts. Plate it up and you’re good to go. Serves this with a bread and dinner salad, or by itself. Here is a printable version of the recipes. Combine the meat and veggies well. Continue to cook over medium heat, stirring occasionally. By this point your water should be boiling for the noodles. Add the noodles to the water and bring to a boil according to the package directions. Generally they cook in about 8 minutes or less. Pour the meat mixture into the pot with the noodles. Stir to combine. Cover the top with shredded cheese. Place a lid on it and let it set for about 3-5 minutes until the cheese melts. Plate it up and you're good to go. This looks delicious! I can’t seem to find you on FB. What’s you “name” on there? It is very yummy and easy. 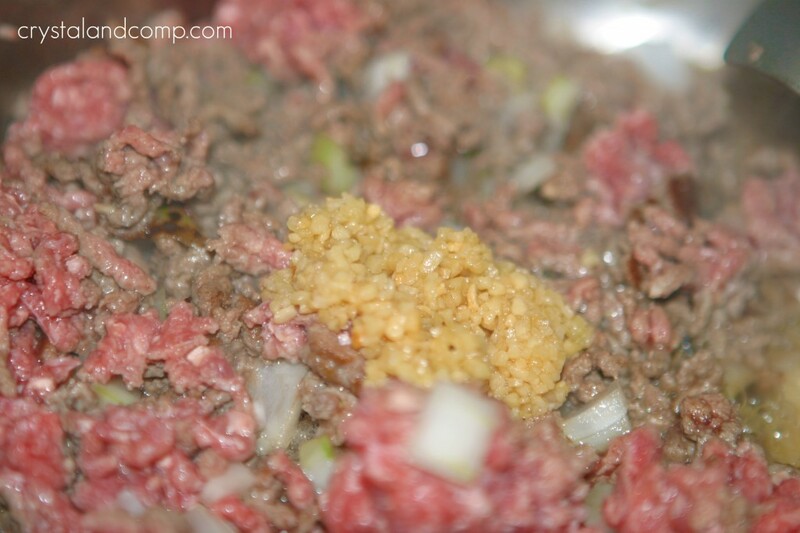 Do you think the meat mixture could be frozen after it has cooked? 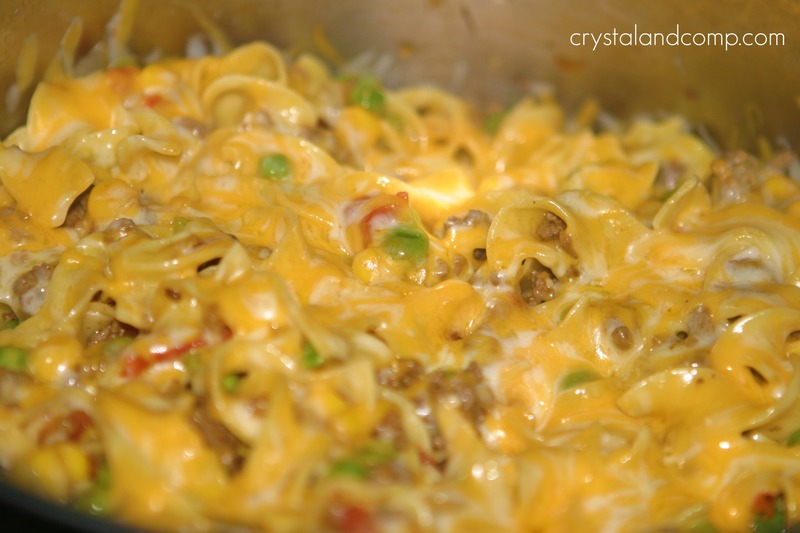 Then on serving night, warm the meat mixture, cook the noodles and add the cheese? Sounds really good. I would love to try it with my meal exchange group. 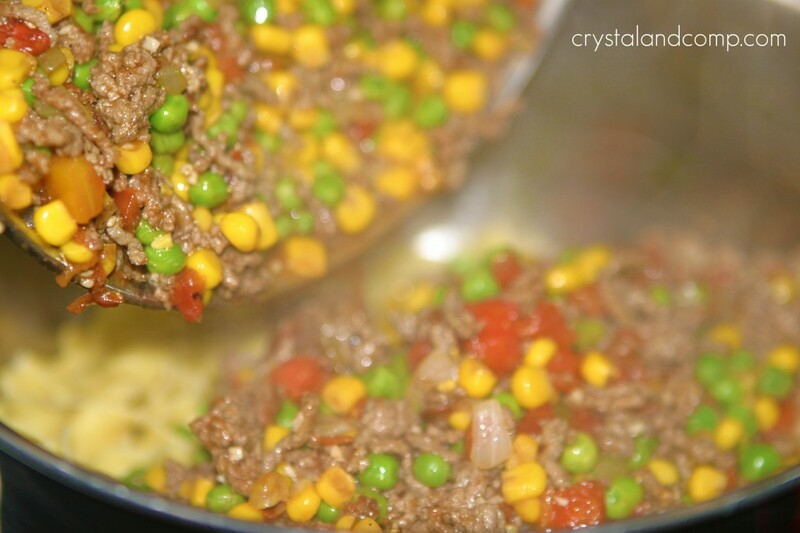 Absolutely you could freeze the meat mixture and then prepare the noodles the night of. I do a weekly menu and today I’ve been stumped for what I want to make this week … thanks to your recipe, I now know at least one meal I’m making! I’m going to feature your recipe in my menu post once I get it finished (later today?) Looks great! This looks yummy! thank you! pinning the recipe now. This looks really good. 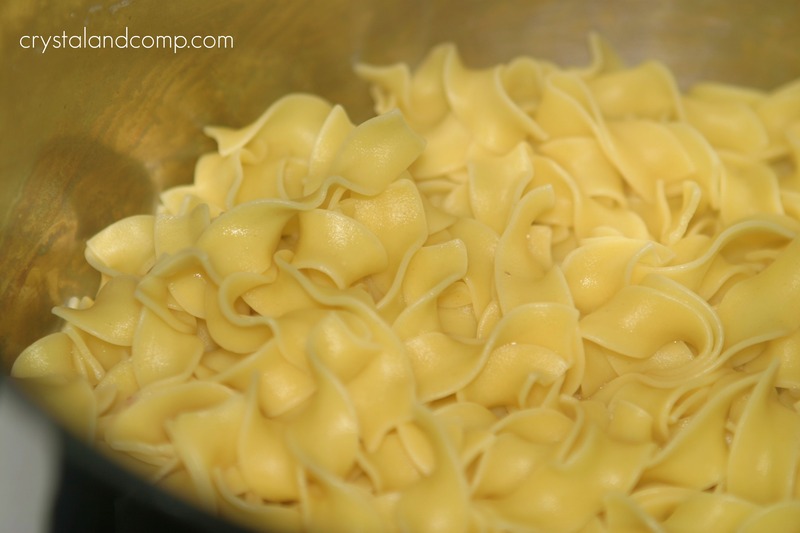 Egg noodles are just comfort food, I think. This reminds me of a recipe that my mom used to make when I was a kid. I can’t wait to try it! Awesome, Laura. Glad it made your menu. Let me know what your family thinks. Thank you so much Emily for stopping by and for your kind words. I have really enjoyed all these great beef recipes. This is a great recipe that we will really enjoy. Hope you are having a great week end and thank you so much for sharing with Full Plate Thursday. Love this! Thanks for sharing! We would love to have you link up some of your recipes over at our party! I’ve never heard of Indiana chowder, but these looks like a great meal! Glad I found this through It’s a Keeper’s linky party. I linked in a salad using leftover roast lamb. Have a super week. Carole recently posted..Weird sign – I wonder if it is real? Awesome, Cristin. I hope your family loves it. Thanks, Mrs. Mordecai. It is a regular comfort food for my family especially in the fall and winter months. I love your Indiana Chowder, it is a winner! Hope you are having a great summer week end and thank you so much for sharing with Full Plate Thursday. You are going to laugh I come from the Northeast (Italian-American) your recipe is down right exotic to me. I would never have thought to mix noodles with corn and chilies etc. 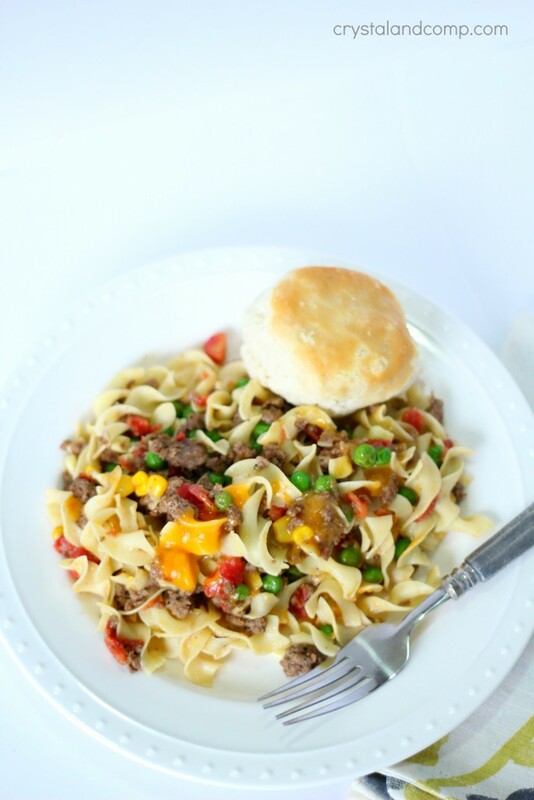 My son who loves noodles and beef is going to be very excited about this recipe. I will pin it too. Diane- my mother is down right against this much starch. Pasta and corn? She would be beside herself if she knew I fed this to her grandchildren. Sounds yummy! I’m getting really tired of my old stand by quick hamburger meals. I definitely need some new recipes! Thanks for this great idea. I’m hosting a linky party “One Creative Weekend” at OneCreativeMommy.com. I’d love for you to visit and link up this idea and/or anything else you’d like to share. To make my hamburger meals even quicker, I cook the hamburger with onions (and whatever veggies I feel like shredding and sneaking in) and freeze it in meal-sized portions. 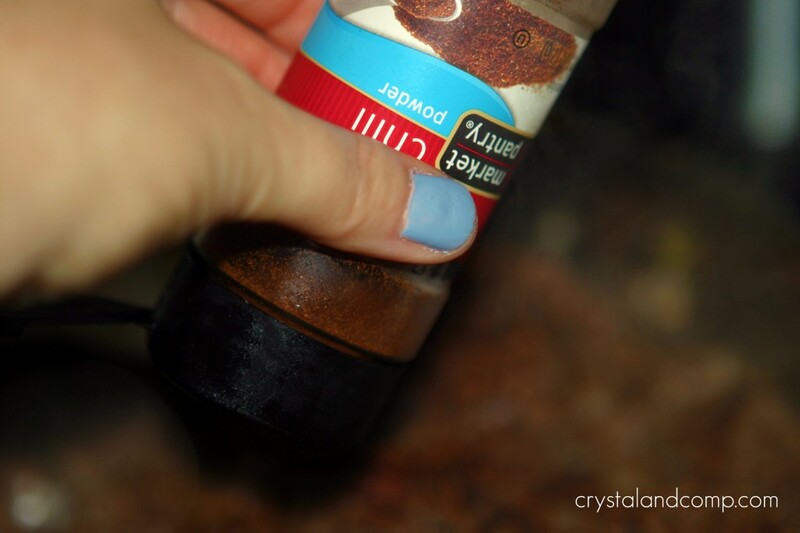 (I do the same for taco meat–adding taco seasoning.) It makes cooking super speedy on a busy day! I am curious whether or not you know how this got its name?? I am from Indiana ~ born & raised ~ but have never heard of this!! However, it does have some faves in it, & it looks & sounds SO DELICIOUS!!!! I will definitely be making up a batch. I have no idea how it was named. It is a recipe my friend Kim shared with me and her husbands family has made it for years and years. And to my knowledge they have always lived in Texas…. so no clue. I am going to try it with the cheese slices; i just now noticed that note about Mike preferring them…& being a major fan of cheese, i believe i agree with him! Btw, i used canned veggies, as i prefer the taste of them. I just made sure i drained them really well…but i bet it would taste OUTSTANDING with some fresh, home-grown vegetables! Do try it with the cheese slices. We have now does it both ways around here. I just had a quick question regarding the recipe. 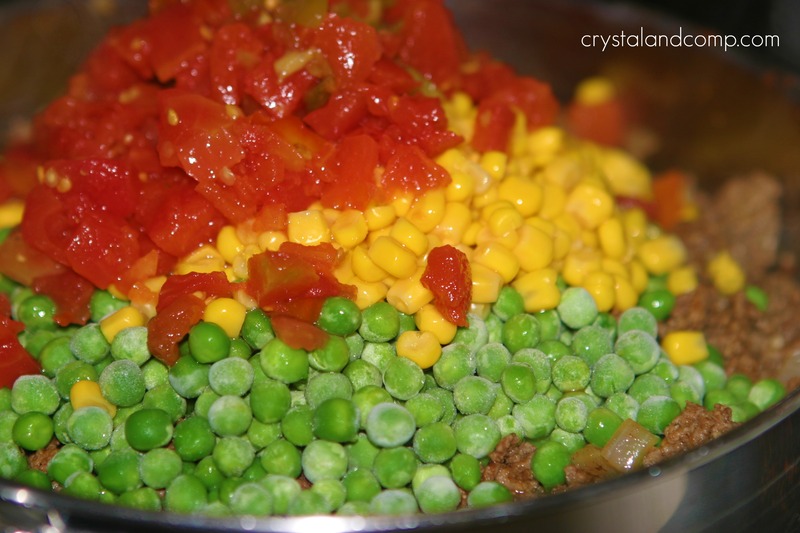 I prefer to use frozen vegetables as well, and I was just wondering about how much of each did you add? Also, did you drain the Rotel tomatoes? Thank you and can’t wait to try it! I do not drain the Rotel and I use about a cup of frozen peas and a cup of frozen corn. Your photos make me drool! LOL Thank you for sharing at the (mis)Adventures Monday Blog Hop. I look forward to what you share this week. This recipe looks absolutely delicious. Can’t wait to try it and see if it is a hit with my boys. Stopping by from the Good Tips Tuesday link up! We absolutely love this meal! My family loves this recipe! This is one of my go-to recipes when I want something quick and delicious. I know that Rotel is a brand of tomatoes. How big is this? I don’t have Rotel in my store.